So it appears that Friendly Atheist over on Patheos, via contributor Rachel Ford, has an article about me and my work on violence and the Bible. The article is based on a piece I wrote for the Huffington Post recently called Questioning Genocide and Slavery in the Bible. 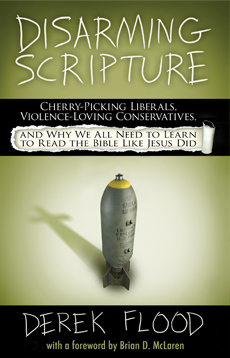 It's worth noting that her article, while it speaks of me "tackling an issue" is not referring to my book Disarming Scripture where I actually have the space to really tackle the issue, but to a single article I wrote, where I can really only skim the surface of such a huge topic at best. "Unlike many apologists, [Flood] doesn’t try to sugarcoat the slavery, genocide, etc. ... It’s more honest than many in that it does not attempt to whitewash horrors, and more compassionate in that it does not attempt to make them seem just." She also notes that she is "not criticizing [Flood's] rejection of hateful and brutal elements of scripture or an outlook 'motivated by love and compassion'" which she shares with me. So there's more things we agree on. "If the purpose of the Bible is not to provide actual moral guidance, but to mix a lot of terrible things that humans have done with good things humans have done in order to teach us how to sort the horrible from the good… well, frankly, we don’t need it. Furthermore, what is God’s role in the Bible? If it is really His book, or its formation governed by His will, how does it further the Divine Plan to accumulate a number of really horrendous things, that (He must know) people will use as the inspiration for further atrocities, and pass it on to humankind without at least some word of caution?" Now, if I was actually proposing this, then her critique would be spot on. But I am not. The key factor here is the idea of a "purpose" for the Bible, as if the good parts, along with some really morally disturbing parts, were all intentionally put there by God as a kind of divine multiple-choice test for us to learn morality. That's what she says I am proposing. So let me clarify: I am not proposing that God purposely wrote a book with right and wrong answers so we could figure it out. Rachel and I both agree that that would be pretty silly. Rather, I am observing (as many biblical scholars have) that the Bible -- and in particular the collection of books that we Christians call the "Old Testament" was written by multiple authors with differing views, each presenting their view as the right one. As a result it contains both things that are morally good and bad because it is a record of conflicting moral visions. That's just what happens when you have people in a moral debate, you get opposing views. What is remarkable about the Hebrew Bible (and this is something that you do not have to have any sort of faith to appreciate) is that it contains not only the majority view, but also contains the voices of protest against that majority view. As Rene Girard has pointed out, that makes the Old Testament unique in world literature of the time. The writings of the Old Testament were the first in world history to allow for the voice from the margins to be heard, crying out against oppression, calling out for compassion. For example the majority voice claims in Ezra/Nehemiah that foreigners were bad and corrupting and thus commands Israelite men to send their foreign wives and children away into the night, never to see them again -- possibly sending them to their deaths, considering the harsh realities of the time. They do this, the text claims, in order to be faithful to the Torah, and to avoid God's wrath at their impurity for having mixed their seed. In contrast, the book of Ruth -- which scholars date as being written at the same time as Ezra/Nehemiah -- instead tells a story from the perspective of one of those despised foreign women. The story is set in an earlier time before the birth of king David. This story of protest from the margins tells of Ruth, a noble and kind woman who encounters mercy from an Israelite man who marries her and who finds "shelter under the wing of Yahweh." Ruth becomes the great grand mother of King David. So that foreign "seed," as the book of Ruth argues, is what their hopes all hang on as they looked for a Messiah to arise from the line of David in the time of Ezra/Nehemiah. Let me stress once again, that I am not proposing that God decided to put both stories side-by-side so we could choose the better one. Rather we have two opposing human voices, both claiming to speak for God. In this case, two opposing moral visions from the same time. One can be seen as a xenophobic treatise against inter-racial marriage, and the other as the opposite -- focusing instead on having compassion for the "other" and the vulnerable among us. Our headlines today present us with that same choice. We hear some voices (Fox News anyone?) drumming up fear towards those who are the "despised foreigners" of our time, Muslims. They do the same with the vulnerable among us, painting for example the poor as "lazy freeloaders." Their position is presented as the true patriotic American view, and as the Christian and godly view. Those same voices also seek to justify violence, whether in the form of drone strikes or torture, appealing to those same claims to be doing so in the name of God and country. Now, if we hear that voice the way it wishes to be heard, as the voice of authority, then we will swallow that moral vision unquestioningly. That's why I say we need to reject the way of unquestioning obedience to anything, and instead learn the way of faithful questioning. We need to learn to join the voices of those from the margins like Ruth or the Psalmists or Job who cry out saying "Wait a minute! That's not right!" I fully acknowledge that atheists like Rachel are doing this, and I applaud that. What I want to point out however is that this kind of moral protest has a long history which begins with the Hebrew prophets, and which was continued by Jesus. So I very much disagree with her assertion that the Bible has "[no] relevance or usefulness to the pursuit of a more reasoned and moral approach to life." Perhaps that is true if we read the Bible through a fundamentalist lens as Rachel appears to be doing (which is understandable since, as her bio states, that is the background she was raised in before becoming an atheist). However, as I argue in my book, we can learn a great deal from the Bible if we can get a hold of the radical way that Jesus read it, as well as getting hold of Jesus' message and way of enemy love. Our current culture is very far away from that way of enemy love today. We do not know the way of enemy love, and we desperately need to. One of the arguments I make in my recent book Disarming Scripture is that we should evaluate things on their merit, and I maintain that Jesus' way of enemy love stands on its own merit as a powerful and much needed way to deal with the many conflicts in our lives and world. That's true for atheists, just as much as it is true for Christians like me, because it's just true, period. That brings me to a second way that Rachel is misunderstanding me, which is that she assumes I am an "apologist" and that consequently my goal is to present an "attempt to explain away the less-than-savory aspects of the Bible." That is most certainly not my goal. My goal is to promote love which I see as the teleological aim of Scripture, and specifically my aim is therefore to work to end religious violence. That is precisely why I do not, as Rachel notes, "attempt to whitewash horrors" or "attempt to make them seem just." That's what fundamentalists do, and I am most definitely not a fundamentalist, nor am I an apologist for that matter. Apologists, as I see it, are a lot like marketing people who want to make things look nice. That's not how I roll. If I answer a question, it is not to do PR for God (which strikes me as a rather arrogant thing for a mortal like me to do). Rather, it's simply because it is a question I really struggle with myself that I have worked through and want to share to help others who are struggling with the same questions. I don't think that being a Christian means I have all the answers, or that questions are things we need to all have answered so we an stop asking them. Rather I insist that learning to question is essential to a healthy faith and moral life. Questioning is the mark of moral character which we need to cultivate. Let me conclude by saying that Rachel does raise an important question: How do we understand God's role in Scripture? She (perhaps based on the assumptions of her former fundamentalist background) asks that question with a lot of assumptions that go along with a fundamentalist perspective -- assuming that God is the author of the Bible and that it's all there -- even the parts we find deeply morally problematic -- on purpose. In what way is God involved in the Bible? In what way is the Bible "inspired"? As progressive Christians we need to have an answer for that question. I'll have to leave that for a future blog post. Or if you just cant wait, you can go buy my book :). "Furthermore, what is God’s role in the Bible? If it is really His book, or its formation governed by His will, how does it further the Divine Plan to accumulate a number of really horrendous things, that (He must know) people will use as the inspiration for further atrocities, and pass it on to humankind without at least some word of caution?" ... is for me the main and most important question. And I've purchased, read, and greatly enjoyed the book. The explanation given there, if I may be permitted to preempt you briefly, is that it's leading us to Jesus but the Bible itself is not Jesus, or God, or the Light of the World. I get that, but it still doesn't answer why we should continue to print Bibles with the non-Christlike-depictions of God in them, when as the Friendly Atheist and yourself agree that those parts have and are taken to do great evil. This doesn't mean we should take even what Jesus said by the exact text, since as you have argued well that has indeed been done and lead to the support of slavery and any number of other atrocities. Having a text pointing us to Jesus which contains a great deal of content that would give us an impression that Jesus is Nothing like he actually is, is dang peculiar and frustrating. I understand the difference between ignoring the bad things and with saying no those were actually bad, but when the bad is left with the good, in essence it leaves it up to the reader to decide how to parse it and which version of God they come away with. "What is remarkable about the Hebrew Bible (and this is something that you do not have to have any sort of faith to appreciate) is that it contains not only the majority view, but also contains the voices of protest against that majority view." Concerning the question about why we continue to print Bibles with "non-Christlike-depictions of God" in them, I believe the answer is in the quote above. We are all free to take sides in the moral debate of the Bible, but by deciding that one side shouldn't be printed anymore, you are going against the spirit in which the Bible was written. The Bible contains a debate about the nature of God, and the debate rages on today. Removing the uncomfortable parts would not result in a better Christianity--it would result in a hundred different Bibles and a hundred different Christianities who would no longer have a common foundation by which to carry on the debate. Matthew, thank you for that response. Makes a lot of sense. Personally, I still struggle with the ramifications of looking at the Bible in this way... how do you decide what miracles did or did not happen, what prophecies were and were not real or from God. If it isn't actually a set of books spoken into existence by the Spirit himself (not arguing that it is) and it's really just the recorded and venerated accounts of people who claim to have experiences with God, then how do you trust any part of it, or decide which parts are ok to emulate, especially the morally neutral parts (like the manna mixed in with mass killings of Israelites mixed in with rock-water mixed in earthquakes and vipers, or the sun stopping mixed with genocide, or the axe head floating in the water or whatever other wonders depicted, the account pre-moses (whether poetic or historical)). So much symbology is mixed in with good and bad things, that... how do you or can you use a scalpel to surgecally determine what is ok, real, and faithful with what was wrong... and is there any determination of "well that may not really have happened" along with "oh yea that happened". I just seems like there are so many themes and symbols interwoven so subtly and deeply from Gen 1:1 to the end of Rev that... sigh.. I'm just trying to take Derek's take on how to view scripture to it's logical conclusion, and it's damn tricky. I can't speak for Derek, but I can give you my take. I love Derek's idea of faithful questioning, but I am also a traditionalist (not a fundamentalist). I believe it's all true and that the Spirit is behind it all (though not in a verbatim dictation sense). Rather than passing judgment on any particular passage, I ask what I can learn from the perspective presented in that passage. I've got an article where I address the genocide of the Canaanites from a questioning / traditional perspective. With Derek's permission, I can post a link. Matthew I would like that link if Derek is cool with it. Also Derek, could you give your perspective on Matthew's way of looking at scripture? Because that has basically been mine also. Jeremiah, I agree with your synopsis. I do like Derek's take on a "love hermeneutic" though. I've read both of Derek's books and started reading as much of Moltmann as I've had time. Moltmann is a good read and he's introduced me to ideas and questions I haven't addressed before. Initially I would have to say that Derek's take leads to a very subjective experience of scripture that sits on a foundation of Jesus - Love (enemy love) - the two greatest commandments. All interpretation has to filter through and flow from those three. This isn't intellectually comforting as many of us brought up in fundamentalism have been preconditioned for black and white thinking and black and white categorizations. I'm still uncomfortable with this approach personally, but I'm going to give it time and consideration. The idea that "religion poisons everything' that Atheists often trumpet is just hyperbole to sell a book at best. I do like and enjoy Christopher Hitchens but he was a capitalist at heart. Why do I bring this up, its because the same type of thinking pervades some of Atheism; black and white - perhaps not to the same extent though. Anyways, initially, I think Jurgen Moltmann makes some good cases worth considering for the uncertainty we are deluged with in our shared reality on multiple fronts. So many thoughts right now on this subject and others tangential to it that I really need to spend some time reflecting on it all. Philosophy is not the dead thing that many scientists declare it as. You hit on one of the key sticking points for me though; what is historically accurate vs myth or other linguistic forms; I don't consider myth a bad thing. Something can communicate incredible truth without being historically or scientifically true. But, Christianity is founded, to a good degree, in its claimed historicity. This becomes convoluted when you study the OT and NT claims. E.g. virgin birth probably is myth, much of the OT may be myth written during exile, the Jesus census most assuredly did not happen as claimed. These are the things I get stuck on as I feel like I'm back listening to a fundamentalist preacher tell me, "this you must believe to be saved" in spite of the fact that it just ain't so in some cases. So I feel like in the Gospels the authors are making things up to try and evangelize the readers and it seems like they are just trying too hard to sell it. It raises flags in my mind. The practiced ideals of enemy love and reconciliation/forgiveness are still exceptionally important to me. These two things are very much needed in our world I think. This is why I read Derek's book and think it is the most honest attempt at reconciling the inherent moral problems in the Bible. Due to the historicity issues I see I remain conflicted though. I also love the Love Hermeneutic and faithful questioning. I think they add a Significant™ part to the puzzle. And Derek does a great job in his book giving evidentiary support to those two premises. You are also right that Christianity is a historical faith. If Jesus didn't raise from the dead, we are to be pitied most of all. ""what is historically accurate vs myth or other linguistic forms; I don't consider myth a bad thing. Something can communicate incredible truth without being historically or scientifically true. "" That is an excellent way to put it. Also though, if things like the virgin birth didn't happen and all these miracles didn't happen, and God can't or doesn't intervene in the physical world beyond the laws of nature, then there would be no reason to trust anything in the Bible. I don't believe that's the case, but I am interesting in thoughts about how to use the Love Hermeneutic and faithful questioning like Jesus and Paul did to apply to the various aspects and characteristics of the Bible. This is a great discussion, and I will weigh in soon. Let me say quickly to Matthew to feel free to post the link. So perhaps it would be helpful to give that a read to further our conversation here. Let me begin with the question of why we should continue to print Bibles with the non-Christlike-depictions of God in them. Wouldn’t it be better to have a Bible that contained just good moral examples that we can affirm? Sure it would. The thing is, we can’t. The Bible we have is the one we have, and that is simply not going to change, even if we wish otherwise. If one group stopped printing it, another would keep printing it. Besides banning books has never worked. 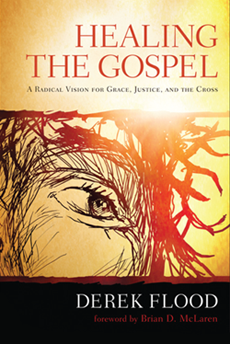 What we need instead is an understanding of how the text should be approached, and that is the task of discipleship. If the OT contains both good and bad things, then we need to approach it differently than we would if it was all good. For the record, the NT sort of is that book that we want. It is not multi-vocal in the way the OT is. So, in broad strokes we need to read the OT through the NT. What we can’t get around however is the need to develop our moral brains, the need to be able to discern as we read. This is something we need to develop. Not just with the Bible, but with life. How do we evaluate what is good and bad? When someone tells of an experience they had with God, how do we evaluate this? This is not easy or simple, but as moral adults that is what we need to learn how to do. This is necessarily subjective because we are the ones doing it. But there is no alternative. We humans are always subjective and fallible and imperfect. When we can face that, we can try and deal with it the best we can. If we deny it and pretend we have certainty, that's when things get really dicey. Thanks for the response Derek. I want to preface anything I say below by saying that I am not trying to be argumentative or just trying to upset anyone. These are honest concerns and questions on my part. There are different levels of subjectivity so using the blanket term of subjectivity can paint an inadvertently unfair picture of equality for all subjective claims. The Bible says the Spirit leads us into all truth, Jn 16:13. The evidence I see of this is quite contradictory. I see divisions upon divisions in Christianity, some of which are irreconcilable and, in my opinion, very harmful individually and socially. So I agree with you on your love hermeneutic, but I'm not seeing the evidence of the relational hermeneutic in reality even though many subscribe to the relational idea of Christianity. Is it just simply that you do not believe other Christian groups are taking the relational idea far enough? If not, why would a relational and communicative God not correct this? We see that he did this with Paul on the road to Emmaus. I'm honestly not looking for definitive answers as there probably aren't any, but I think these questions need to be wrestled with no matter how uncomfortable the conclusions may become. As I've stated I think your track is the right/best one, but I see problems with the relational idea that make me seriously question its reality. I'm not sure I'm tracking with you, so perhaps you could clarify? The method I propose in Disarming Scripture is based on evaluating an action or belief based on observing the fruits in people's lives. I go into how we can incorporate the tools of the sciences to make this as objective as possible. Is that what you mean by my "love/relational hermeneutic"? It sounds like you may be referring to something else. So I just want to make sure we are on the same page and talking about the same thing. Yeah, you pointed out a blind spot I was hitting. Wasn't making a connection with your reasoning even though it is now obvious. You addressed it in your answer, thank you and sorry. Thanks Derek for the responses. I think where I next have problems is, if we use scientific inquiry, experience, and how things work out, to determine whether something from the Bible is worth following, and we do the faithful questioning of Jesus in the NT, then how can we know (I know, I know, we can't really) that even what Jesus says of himself or what others say of Jesus is true or legit? As far as fruit, I am confident you could find atheists with more good fruit than ardent Christians, which would on its face make an argument that you need Jesus or the Spirit to produce good fruit unnecessary. Since none of us was there with Jesus or at any point written about in scripture, if it's all subjective then how can anyone say or know anything objectively? 18And we heard this voice when it came from heaven while we were with Him on the holy mountain.19So we have the prophetic word strongly confirmed. You will do well to pay attention to it, as to a lamp shining in a dismal place,af until the day dawnsag and the morning star rises in your hearts. 20First of all, you should know this: No prophecy of Scripture comes from one’s own interpretation, 21because no prophecy ever came by the will of man;instead, men spoke from God as they were moved by the Holy Spirit." I understand Jesus' way of Faithful Questioning. Given that, how can we trust what is written about him, the church, or whatever, in the Gospels and Letters, or OT for that matter, without having access to the players.
" I am confident you could find atheists with more good fruit than ardent Christians"
Let me clarify that I am not suggesting that we look at the fruits of a person's life to judge that person. I am suggesting that we evaluate if something is good by looking at the effects. For example we can look at the effects of washing hands and determine that it is good for our health. We could look at the effects of hitting children with a belt and determine that it is not good for them. So if there is a teaching of Jesus that we apply in our lives, we could evaluate the effects this has. For example what is the effect in a person's life of practicing forgiveness or developing empathy? What is the effect in a person's life of cultivating fear? Love this Derek. I shared on FB and linked back here. Looking at the effects of my actions on others was life changing. It moves us from infancy toward adulthood. Christians love to judge fruit by looking at doctrines or evidence of love, joy, peace etc but I think this is what it is all about. Do my actions bring the effect of life and health or are they death and deterioration?